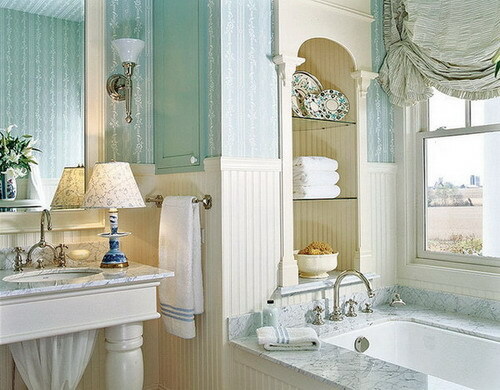 Bathroom designs and accents can make the room look stylish and complement each other. Whether you’re updating your existing space, building a new home, adding an extension to include a large bathroom or upgrading your fixtures and fittings, careful planning will help you achieve the bathroom of your dreams. Even in a small room, you can work wonders with the range of stylish, space-saving designs available. When choosing a bathroom scheme, the first thing to do is decide on the layout. 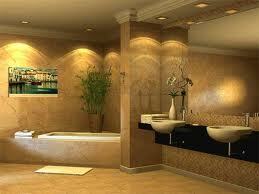 The current trend is to include spa baths and walk-in wet rooms. However, before you knock down walls or move waste pipes, contact your housing society to get requisite approvals and also find out about safety regulations from the municipal corporation. This is important as it will influence the design of the room. Be realistic about the possibilities – there’s no point in including a separate shower in your design if there’s not enough space to open the cubicle door. If in doubt, measure the room and check manufacturers’ guidelines on how much space to leave between fittings. Make a list of all the utility zones you want to include – bath, shower, water closet, wash basin and so on; and any extra fittings, like an exhaust fan, electric-shaver points, shelves or additional heating. For smaller spaces, consider a combined bath/shower mixer and a shower curtain fitted above the bath. Modern bathroom design is all about enhancing the bathing experience, with an emphasis on calming frayed nerves and soothing overworked bodies. Its no longer just aesthetics that matter, technology too has made inroads into your private space. Style is ultimately about stamping your personality on a room, so the sky is the limit – but be open to current trends in modern bathroom design. These include ensuites which seamlessly carry through the design ethos from the bedroom into the bathroom, and are the ultimate in convenience and luxury. 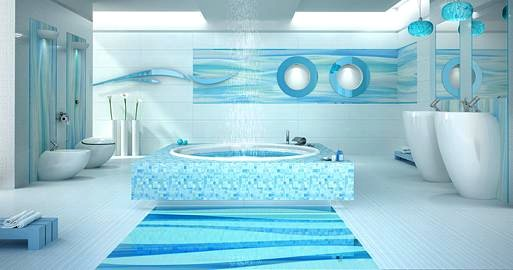 From Jacuzzis to high-tech shower cubicles bathing just got a lot more luxurious. Showers can be hand-held, wall-mounted or ceiling-mounted. You will need to choose from adjustable shower heads, sprays and steam units. As much as the shower or the bathtub contributes to the look of the bathroom, fittings also play an equal part in enhancing its look. Fittings are a lot of fun to shop for and include faucet handles and spouts, outlets and controls in the whirlpool tub, pop-up drains, mixing valves for the shower, trip levers for the toilet, hand sprays or other added sprays in the shower, and many more. Fittings are also called the ‘jewellery’ of the bath. You can pick from varied styles ranging from old-fashioned cross-handles to modern single-control units. Distinctive wrist-blade handles are the easiest to use. If you opt for the traditional or modern style your pick should be the levers. Shower fittings are just as varied as those for skins. Traditional faucets have separate hot and cold controls. Modern faucets, on the other hand, have single-handles. The showerhead will vary in its stream intensities as well as its style (adjustable, sunflower style or drenching rosette being some of them). Choose bathroom fittings with appropriate finishes that complement the look and feel of your bathroom. You’ll need to plan for adequate storage to keep your bathroom clutter at bay. Make a list of the items, including essential toiletries and allocate space for everything. Look out for slender wardrobe-height cabinets for your towels. Consider storage at the initial planning stage, in order to maintain a clean and clutter-free space. Storing items in a bathroom has never been easier. Multi-purpose mirror/shelving systems can hide toiletries and medicines, and over-door containers and under-counter basins with fitted shelves are among the other space-saving options available. When choosing a toilet or bidet, consider the space available, the size and shape of the toilet, and the style that will be in keeping with the rest of the room. In addition, you can select a wide range of features like water-saving options, heated seats and concealed cisterns. Traditional close-coupled styles have a visible cistern, whereas the cistern is hidden with back-to-wall designs. During construction stage, use the space above the cistern for storage niches to place knick-knacks or even smaller pieces of linen. High-level cistern with pull chain: This has now been updated with modern plumbing and is a popular choice for older houses. Bidets: These can be an added element, if your bathroom is spacious. Back-to-wall WCs: These come with a cistern that is concealed behind a wall to save space and give a streamlined look. For this, you need to ensure that access to your cistern is built-in. Wall-mounted WCs: These are an excellent option for a small bathroom. They too have the cistern concealed behind a wall, but the toilet does not sit on the floor. This design looks more streamlined and also makes it easier to clean the water closet.